The Broke and the Bookish : Kelly's Review of "The Autobiography of Henry VIII"
Kelly's Review of "The Autobiography of Henry VIII"
I've read countless books about Tudor England, the majority focused on Henry VIII's wives. I've heard the same stories dozens of times, but they never, ever get old. In these countless books, Henry is almost always portrayed as a tyrannical, mad, lusty old fat guy. He is written to be evil and disliked, the antagonist of his own realm. In this book, Margaret George took on one of the biggest challenges ever: to write the life story of this infamous king - all from his point of view, actually giving him a chance to defend himself. My first impression was suspicion and doubt that that could ever be done, but boy, did she pull it off. The book is written in memoir form. The actual diary is being sent from Henry's fool, Will Somers, to his illegitimate daughter, Catherine Knollys (the niece of Anne Boleyn). Will Somers throws in some quirky little thoughts now and then, which is quite enjoyable. Henry's memoir starts from his early childhood as the overlooked second son of Henry VII and Elizabeth of York, and runs all the way to shortly before his death, when he is the ailing King of England and on his sixth wife. My favorite aspect of this book was how it changed my view of Henry. Margaret George's Henry VIII is not obsessed with women or heirs, like we've seen before; this Henry is mostly focused on his struggles with religion. We find logical reasons for why Henry did some of the tyrannical things he did (though they may just be speculations). I actually sympathized with this man in some parts. You might think that in order to read a detailed memoir of a famous king who ruled for many years you would need to previously know a lot about him or this time period. Well, you don't. His family history, wars, famous people of the day and customs are all explained to you by Henry (Why? I don't know.) 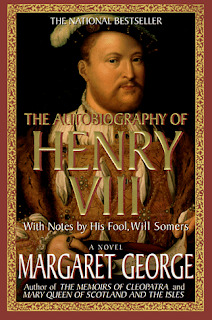 As usual with a Margaret George book, The Autobiography of Henry VIII is HUGE! It may be 900-plus pages, but don't be daunted! The reading actually passed very quickly for me, as I was enjoying it so much. I wish I could give it more, but 5 stars will have to be sufficient for now! I own two Margaret George books and I agree that they are definitely doorstoppers and look daunting. I haven't read either one yet, BUT I actually really want to delve into my copy of Henry now, because like you, I'm a total nerd. YAY! This is still on my TBR list, I even own the book. I really need to find time to read it! Everytime I hear someone talk about it, it makes me want to read it even more! It sounds really amazing. I was actually thinking I'd have to learn more about the time period before getting this book when you said it wasn't necessary to understanding it. Hee. Thanks for the rec, this is going to my TBR list. I have always been such a big fan of the Tudor period, I definitely have spent more time researching good ol Henry than I'd like to admit. I haven't heard of this book before, but it's officially on my TBR list. Great review! This sounds very interesting! I'll have to keep an eye out for it. Thanks for sharing, and great review! Huh. I don't know very much about the Tudor period (I live under a rock, but I have other fine qualities), but I'd love to have a fun introduction like this. I will add it to my 2012 TBR list. I have read a ton of books on the Tudors and The Autobiography of Henry VIII by Margaret George and The Six Wives of Henry VIII by Alison Weir are my absolute favorites!